In this article I want to take a look at some interesting ways to play various arpeggios by using string skipping and a combination of right and left hand tapping. I am mainly going to focus on 7th arpeggios for now. I am sure you are all familiar with the guitarist Eddie Van Halen. He really made right hand tapping famous (tapping with the picking hand). Many people are not so familiar with left hand tapping (tapping with the fretting hand). With left hand tapping we simply hammer on from nowhere. 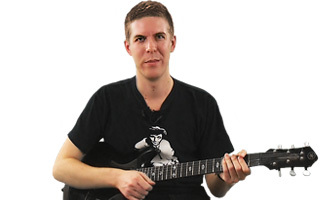 This technique has been penned by the amazing guitarist "Greg Howe" as "taps from nowhere." This can be hard at first, as we can tend to get some undesired, extraneous noises if our muting technique is not up to snuff. Many guitarists tend to use some kind of device to mute the strings up by the first or second frets, but with a proper muting technique this isn’t 100% necessary. The arpeggios I have provided will cover a lot of ground harmonically speaking, even though they are all identical in terms of the technique and tap occurrence, they all provide their own technical challenge. The biggest challenge would be to keep them perfectly in time and even in tone. Many players try and rush hammer-ons, pull-offs or tapping. It is much harder to play the examples perfectly in time and with evenness of volume then it is to play them fast and sloppily. I suggest you set your metronome at a fairly slow tempo and that you focus on accuracy, cleanliness and muting. There is nothing worse than hearing a fast guitar passage that is played sloppily and with tons of background string noise. In my mind, this is what really divides the amateur guitarists from the polished professionals. You may find that only a handful of the provided examples are of use to you at the moment. I suggest you focus on learning the following: Minor 7, Dominant 7, Major 7 and minor 7b5 (this one isn't as essential). Many of the other arpeggios are slightly more unusual sounding but harmonically more intriguing. I suggest you try all of them to find the ones that sound good to you . The 7sus4 arpeggio is an interesting one and can have a lot of uses as it is neither major nor minor. You can try using it over both chord types to find some interesting sounds. The most important thing is that you try and make music out of these arpeggios. Perhaps even try to compose a piece of music utilizing some of these arpeggios and technical approach. You may want to try making some arpeggios of your own. Remember that they don’t necessarily have to be played fast. No one ever wrote a rule saying that tapping can only be used to play fast, and even if they did, rules are there to be learned then broken! I hope you really enjoy using these arpeggios and be sure to check out some of the following guitarists that use this technique very well: Eddie Van Halen, Greg Howe, Prashant Aswani, T.J. Helmerich, Stanley Jordan, Steve Vai, Joe Satriani and many, many more! Good Lick!.... erm, I mean Luck! You can also download the PDF file for the exercise by clicking here.